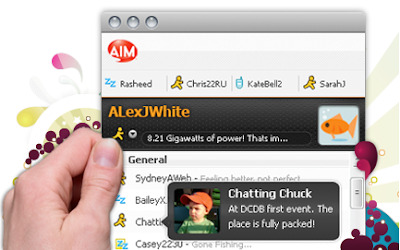 AIM team added new features to their web-based IM client. AIM Express will now include tabbed IM conversations to avoid having multiple windows open within a single screen. Users will also be able to leave away messages that will be displayed even if they are not online, and view their buddies' statuses and away messages by rolling their mouse over screen names. You can now send text messages to your buddies via AIM Express by typing their cell phones numbers on your buddy list. AIM Express is compatible with most popular Web browsers, including IE 6 and 7, Firefox 2 and 3, and Safari 2 and 3 for Mac users. Google Talk or Gmail Chat ? Does Instant Messaging mean Social Rudeness ?